Under partly sunny skies and relatively balmy temperatures in the low 50s, the Venta Maersk sailed through the Bering Strait this past week and steered hard to port, beginning a modern-day voyage of discovery that could hearken a transformation for global shipping and the Arctic environment. The Russian company Rosatom, which runs the largest nuclear-powered ice-breaking fleet in the world, boasts that the route has “no queues and no pirates,” an allusion to the threat posed by African buccaneers in the Gulf of Aden in recent years. 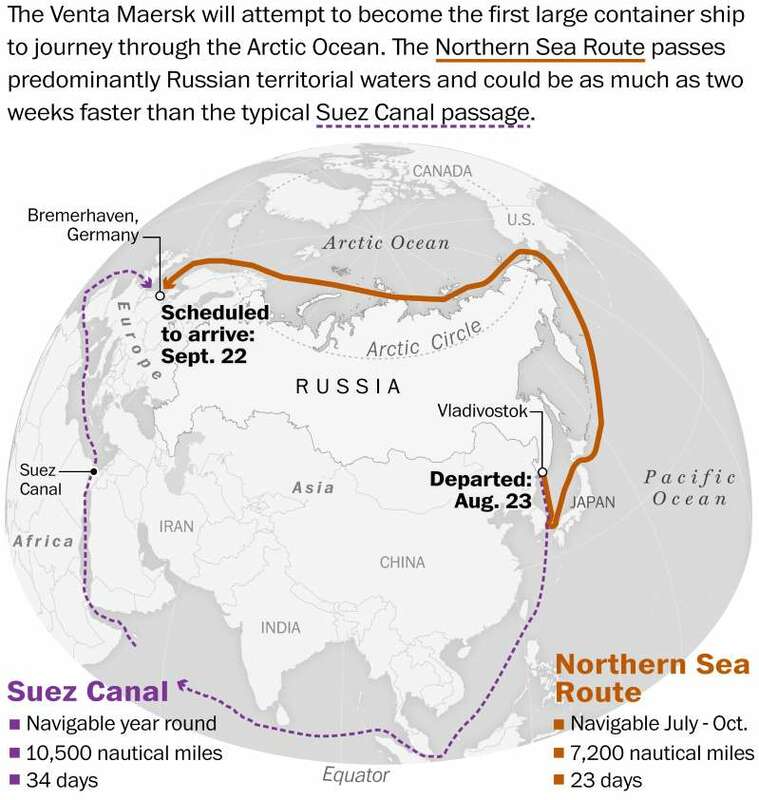 Russia shipped the first load of liquefied natural gas from its new, $27 billion Yamal production facility above the Arctic Circle to China’s port of Rudong in July, completing the inaugural trip in 19 days at sea — 16 fewer days than via the Suez Canal. Gas shipments from Yamal to Europe became routine earlier this year. “Even if the ice continues to recede, it doesn’t mean that conditions will become easier for commercial vessels. There will be an even higher risk that huge floating pieces of ice could break from the pack ice and collide,” he said. “Reinforcing vessels for ice conditions costs a lot.